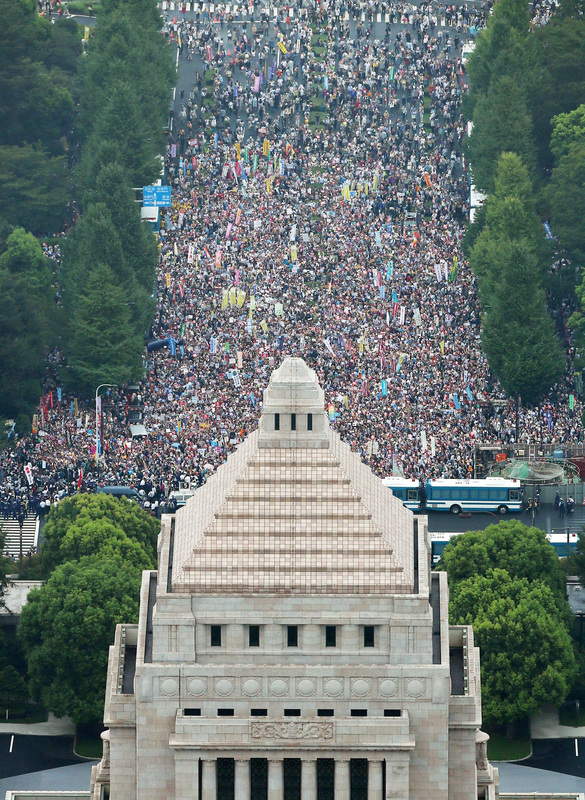 Tens of thousands of protesters rallied outside Japan’s parliament Sunday to oppose security legislation in one of this summer’s biggest protests ahead of its anticipated passage next month. “No to war legislation!” ”Scrap the bills now!” and “Abe, quit!” they chanted during the demonstration in the government district in Tokyo, filling the street outside the front gate of the parliament, or Diet. The demonstrators oppose legislation that would expand Japan’s military role under a reinterpretation of the country’s war-renouncing constitution. Among the protesters were Japanese musician and composer Ryuichi Sakamoto and opposition party leaders including Katsuya Okada, head of the Democratic Party of Japan. Read more in The New York Times here. Additional reporting in Japan Times here. Read more about Article 9 on Yoko Ono’s Imagine Peace here.